Barilzar's Mazed Band was an artifact of immense power created by the Clockwork Mage Barilzar in the middle of the Second Era. It was created with the primary purpose of being a means of teleportation, and is capable of teleporting both the wearer and people who touch the wearer at the time of teleportation. The ring's powers far exceeded Barilzar's intentions, as it was able to open rifts in time and space, and could even open the gates of Oblivion, releasing nightmarish creatures upon the land. The ring was cursed and stripped of its power, so that only a god could use it without being destroyed. This curse is thought to have resulted in the death of Barilzar, although the mage lived on as an undead lich and was sealed within an abandoned crypt in Old Mournhold, along with the ring. In the late Third Era, the cave-in blocking his crypt was excavated at the orders of Almalexia, linking it to the temple sewers beneath the city of Mournhold. In 3E 427 Almalexia sent the Nerevarine to retrieve the ring from the crypt. Barilzar defended the Band with his life, determined that the artifact should never be used again, but he was slain and the ring was brought to Almalexia. Although the ring was cold, the embers of its power still burned within, and she used her magic to reawaken its power. Although she had claimed that possession of the ring would help her to better care for her people, Almalexia had obtained the ring for a malicious purpose. Driven to madness by the loss of her divinity, she planned to murder her fellow Tribunes, Sotha Sil and Vivec, as well as the Nerevarine. Her first target was Sotha Sil, who had withdrawn from the world and now dwelled within his Clockwork City. She used the Mazed Band to journey to the Clockwork City and kill Sotha Sil. She then used the ring to teleport Fabricants from the Clockwork City to Mournhold. These semi-organic robots were creations of Sotha Sil, and they caused havoc in the streets of Mournhold. Almalexia then claimed that the reclusive Sotha Sil had been driven mad and was launching an attack on the city. Using this ruse, she tricked the Nerevarine into going to the Clockwork City to kill him. There, Almalexia confronted the Nerevarine, but she was defeated in combat. The Nerevarine took the Band and used it to teleport back to Mournhold. The ring had the ability to teleport its wearer between Mournhold, the Clockwork City and Vivec City, or temporarily summon a fabricant; no elements of its curse or evil powers remained. In 4E 201, Mecinar, a former Clockwork Apostle who was banished from the Clockwork City for his perverse research into creating the perfect lifeform, employed treasure hunters from across Tamriel to retrieve Barilzar's Mazed Band to use in order to return to the City to see his vision through. In an effort to claim the riches that may lie in the city for themselves, The Forgotten Hero along with their adventuring party, tracked the Band to Forelhost in the Rift. The heroes however didn't realize that treasure hunters in the employ of Mecinar followed them, and easily stole the band from them after they were weakened. The Forgotten Hero's friend, an Argonian named Swims-at-Night, would not give up his prize, and reached out and grabbed the hunters while they were using the ring and was teleported into the city along with them. The Forgotten Hero determined to rescue his friend, sought the help of Divayth Fyr's daughter, Alfe Fyr, and was teleported into the Clockwork City. The Hero saved their friend, and defeated Mecinar. It is unknown what happened to the Band subsequently. The BiPolar Blade is a strange artifact of some renown. 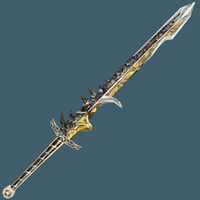 According to legend, a nobleman sank his fortune into creating a longsword of supreme power. Two smiths on opposite ends of Tamriel created each half of the blade, unaware of the other, with the hope that no one man, save the owner of the blade, would know its true power. Unfortunately, the smiths were not given enough instruction, and created halves with enchantments that completely negated each other. The blade is simply regarded as an expensive curiosity for collectors. By 3E 427, it had come into the possession of Sunel Hlas, a wealthy trader and widower living in Mournhold. It is rumored that Hlas relinquished ownership of the blade later that year, and it was given to Torasa Aram to be put on display in her museum of artifacts. 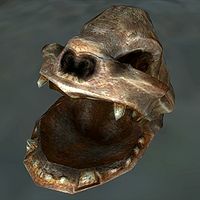 The Bittercup, or the Bitter Cup, is an artifact sacred to Clavicus Vile, the Daedric Prince of Bargains. It is prized by the Daedra Lord's followers. The Bittercup was lost for many years, until it was discovered in 3E 427, in the ancient tower of Ald Redaynia. 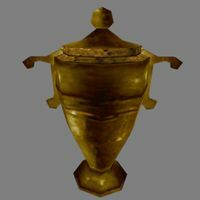 The cup was recovered by the Thieves Guild, and brought into their possession. 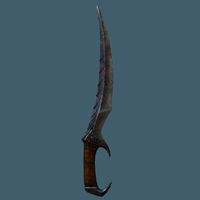 The Blade of Woe is an ebony dagger associated with the Dark Brotherhood. In appearance it is a simple dagger, but it can serve as a potent weapon in the right hands. At its most lethal, the dagger instantly kills its target and can shroud the wielder from view. It is also known to damage or drain health, deplete magicka and willpower, and demoralize anyone struck by it. The blood spilled by the blade may become tainted, and it has also been known to completely incinerate targets marked for ritual execution. In the mid-Second Era, every member of the Brotherhood could call upon the blade. When wielded by those of higher rank in the Brotherhood, using it to kill could hide the wielder from view. Despite it being a single weapon, it could be summoned simultaneously by any number of assassins. 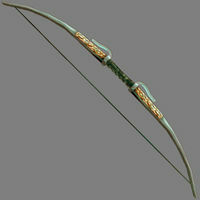 Though assassins were not required to use the Blade of Woe to kill their targets, some contracts offered bonuses for using it to eliminate the target. In 2E 582, the Black Hand tasked the Brotherhood's Gold Coast sanctuary with performing a ritual known as the Litany of Blood with the blade. This ritual could only be performed by the "unshriven" Soulless One who had seen beyond death. 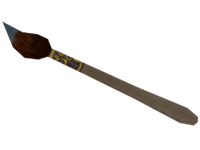 In 3E 433, the supposedly virgin Blade of Woe was given by Lucien Lachance to the Champion of Cyrodiil when they were invited to join the Brotherhood. The Champion did join the Brotherhood and rose through the ranks, maintaining possession of the apparently mundane dagger. After the third Purification of the Brotherhood, and the subsequent decimation of the Black Hand ending with Lachance's own death, the Champion attended a meeting to commune directly with the Night Mother below the Lucky Old Lady statue in Bravil. During that meeting the true traitor to the Brotherhood was revealed, and as a reward for the Champion's proof of loyalty, the Blade of Woe's true power was unlocked. In 4E 201 the Blade of Woe was in the possession of Astrid, the leader of the last known active chapter of the Brotherhood. Astrid was killed by the Last Dragonborn, who then took possession of the blade. The Bloodskal Blade (also known simply as Bloodskal) is an ancient Nordic artifact. In appearance it is an enchanted silver sword, either a long blade or a greatsword, sometimes decorated with red markings. It has the power to either cause magical frost damage to those that it strikes, or release a ribbon of mystical energy, a red energy blast which can hit an out-of-reach target. The blade was created by the Bloodskal clan, a clan of Nords on Solstheim. It came to rest in Bloodskal Barrow, guarded by draugr. The energy blasts released by the blade were necessary to open a strange door within the ruins. In 3E 427, the sword was discovered by the Nerevarine, on an altar near the entrance to the barrow. The Nerevarine took the sword, which summoned several undead skeleton guardians. By 4E 10, the artifact had returned to the ruins of Bloodskal Barrow. It was placed on a pedestal, in a large chamber behind the door which required the sword to open. That year, the East Empire Company broke through into the ruins from the Raven Rock ebony mine. Gratian Caerellius and his assistant Millius were tasked with exploring the ruins. Gratian discovered the sword, but removing it from its pedestal awoke a horde of draugr. The two adventurers died from their wounds, and the EEC sealed the ruins, claiming that Gratian had died in a tunnel collapse. In 4E 201, Gratian's great-grandson Crescius Caerellius uncovered old documents belonging to his ancestor, which affirmed his suspicions over the cause of Gratian's death. An old man, Crescius was unable to venture into the mines; instead, he enlisted the help of the Last Dragonborn, who then unsealed the entrance to the ruins and discovered Gratian's body, along with the Bloodskal Blade. The Dragonborn used the blade to open the door in the ruins and escape the barrow, and related the discovery of Gratian's remains to Crescius. The exact length of the Book of Life remains unknown, but the info on Daggerfall is found on page 933. The Boots of the Apostle are very mysterious. The wearer of the boots is rumored to be able to levitate, though sightings of them in use have been extremely rare. They are relics of Tiber Septim and legendary treasures of Cyrodiil. 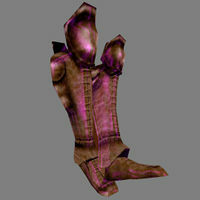 The Nerevarine reportedly recovered the boots and sold them to the Mournhold Museum of Artifacts in 3E 427.